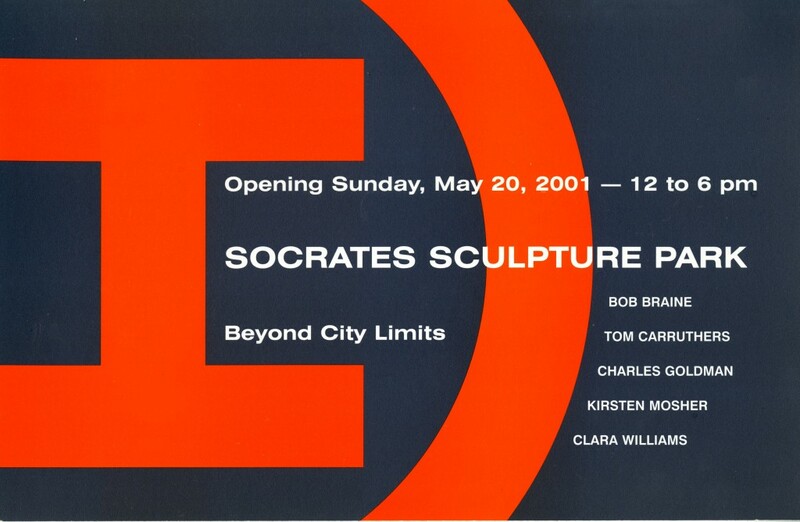 Socrates Sculpture Park is pleased to present the exhibition Beyond City Limits. Organized by the Park’s new Executive Director, Alyson Baker, this show features works by Bob Braine, Tom Carruthers, Charles Goldman, Kirsten Mosher, and Clara Williams. The artists have worked on site to create pieces that respond to the Park’s unique character as a natural environment in an industrial setting; a landscape inscribed by uses that have included a ferry terminal and an illegal dump, and culminated in a reclamation that produced a city park. 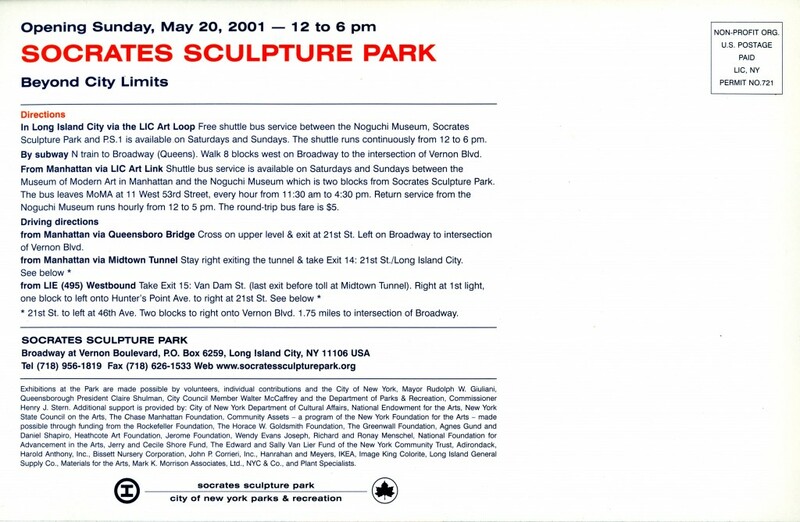 Socrates Sculpture Park represents a meeting point of the commercial, municipal, and natural uses of land, and for this exhibition the four and a half acre waterfront lot is a platform for addressing ideas about the ways in which the contemporary landscape is defined, observed, and charted. Exhibitions at the Park are made possible by volunteers, individual contributions, and the City of New York, Mayor Rudolph W. Giuliani, Queensborough President Claire Shulman, City Council Member Walter McCaffrey and the Department of Parks & Recreation, Commissioner Henry J. Stern. Additional support is provided by: City of New York Department of Cultural Affairs, National Endowment for the Arts, New York State Council on the Arts, The Chase Manhattan Foundation, Community Assets — a program of the New York Foundation for the Arts — made possible through funding from the Rockefeller Foundation, The Horace W. Goldsmith Foundation, The Greenwall Foundation, Agnes Gund and Daniel Shapiro, Heathcote Art Foundation, Jerome Foundation, Wendy Evans Joseph, Richard and Ronay Menschel, National Foundation for Advancement in the Arts, Jerry and Cecile Shore Fund, The Edward and Sally Van Lier Fund of the New York Community Trust, Adirondack, Harold Anthony Inc., Bissett Nursery Corporation, John P. Corrieri, Inc., Hanrahan and Meyers, IKEA, Image King Colorite, Long Island Gerneral Supply Co., Materials for the Arts, Mark K. Morrison Associates, Ltd., NYC & Co., and Plant Specialists.